HA NOI (VNS) — Building a national brand name for Vietnamese rice that can give it prestige in the world market is an urgent requirement. Such was the takeaway from a Vietnamese rice seminar co-held by the Ministry of Agriculture and Rural Development (MARD) and Ministry of Science and Technology on Tuesday in Ha Noi. In the world rice market, competition from traditional competitors has become increasingly tough while new competitors - Cambodia, Myanmar and the United States – are on the rise. The Government recently approved a project to build a strong global brand name for rice by the year 2020. It is the first national branding project approved for an agricultural product and therefore serves as a pilot for other key agricultural products in the future. The project seeks to improve the image recognition of Vietnamese rice and expand its market share in the world. The national rice brand must find a way to communicate Viet Nam's history, culture and tradition to the world. Seminar attendees advised that the project strategy focus on two issues: identifying quality-conscious markets, such as the US, EU and Japan to export high-quality varieties; and retain traditional markets with medium-quality rice. 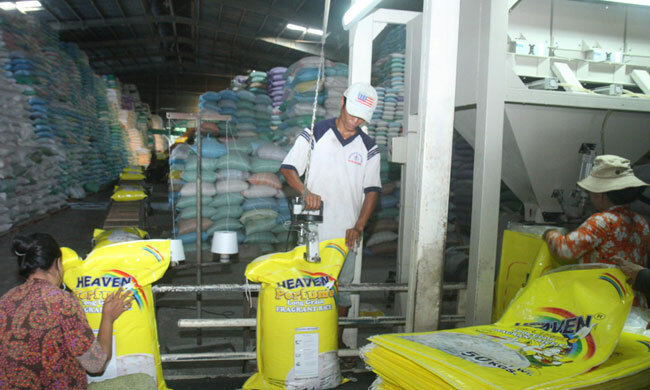 The project developers said that the 2030 target is for 50 per cent of the nation's rice to export under Vietnamese brands. Vo Thanh Do, deputy head of MARD's Agricultural, Forestry and Fishery Product Department and Salt Production, told the seminar that creating a brand name for rice has already faced several difficulties. Although Vietnamese rice production achieved several export successes in recent years, the industry as a whole faces many challenges, said Do. The country's rice production is largely harvested on small-scale plots. More than 85 per cent of rice farming households work on less than 0.5 hectares of paddy, he said. The small-scale production means low productivity and quality, rice farming ideally requires two hectare plots. The sector has several rice varieties, but notably lacks high-quality rice varieties needed to boost export value. At present, Vietnamese rice has only penetrated low- and medium-level markets; high-quality strains accounted for a small share of the world market. Building up a brand name would redefine Vietnam's rice export value and expand its reach. Currently, there are 200 medium- and large-scale Vietnamese enterprises involved in global rice trading. "But," Do said, "Vietnamese rice in the world market now has not created an impression yet." Le Thanh Khiem, deputy general director of Tien Giang Food Company, one of the biggest rice exporters in the country, said Vietnamese rice faced difficulties in exports precisely because it lacks a brand name. Focusing on special rice varieties plays an important role in branding, Khiem said. "Thailand is a successful story for rice branding. It's because they focused on some outstanding varieties," Khiem said. "But, so far Viet Nam hasn't picked a few good varieties to focus on out of hundreds for a brand name," he said. "Most Vietnamese rice varieties became degraded in a short period of time. To successfully brand a Vietnamese rice, we should choose some good varieties and preserve the genes to ensure stability in rice production", he added. Khiem also pointed out another shortcoming, farmers mixed different kinds of rice. One alternative presented at the seminar, came from Cao Tuan Nam, president of Thap Muoi Clean Agricultural Development Company. He said his company was branding organic rice for export.